The Hidden Ireland...: No impinging on English speakers? At what cost? No impinging on English speakers? At what cost? It would appear that a long long history of impinging those who are Irish speakers is to be defended by the Right Honourable Lady. This is a list shared on social media. It will indeed be interesting to see how the new Sinn Féin leadership plan to remove the centuries of impingment on the lives of Irish speakers. The fact that the party has elected a leader who is not an Irish speaker (A first for this party?) hardly fills one with hope. 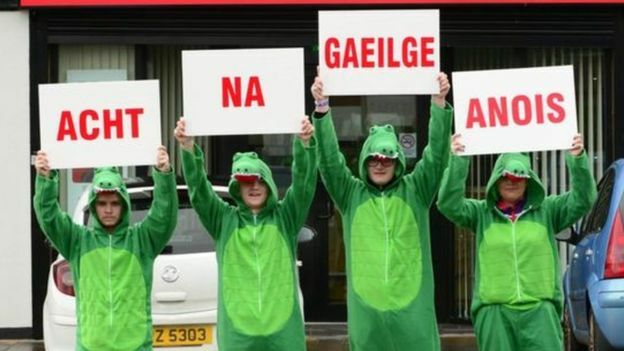 "People who support the call for an Irish Language Act have been asked to copy and paste these facts on their Facebook page, given that some sort of compromise deal looks likely to happen in the coming days. It is well worth looking at these facts to remind ourselves how the state has dealt with the Irish language historically and to realise why the Irish language community are wary, to say the least, of trusting the Unionist establishment to do the right thing about anything that concerns the language. 1893: Thomas Lea, Unionist MP, South Derry – Proposes that Irish should be banned in National Schools and in Courts. 1900: James Rentoul, Unionist MP for South Down – Expresses Irish has no value, opposes bilingual signage, and expresses a desire for Irish to die out. 1912: Unionist politicians bring forward a proposal that only English be used in any new parliament, in the courts, and in the Civil Service. 1922/23: Grants paid to the Irish Teacher Training Colleges in Belfast removed; bilingual programme ceased in the Tyrone Gaeltacht. 1923: New Education Act for Northern Ireland: Irish banned as an optional subject in 5th Standard. Numbers studying Irish decline by 50% within two years. 1926: Irish banned as an optional extra in Standards 3 and 4, 70% of students studying Irish have to cease their study of the language. 1927: Comhaltas Uladh told: “Lord Charlemount is a Minister of firmness and backbone and the members of the Gaelic League have found he is neither to be cajoled nor threatened into doing something which would be subversive of the true educational interests of the Province”. 1933: All payment towards the teaching of Irish in Primary Schools ceased. Would remain so for over 80 years. "A deputation from the Gaelic speaking families in Belfast would appreciate a meeting with you (Dept. of Education, Dundonald House), to discuss the possibility of founding a primary school for their children." Reply from John Benn, permanent secretary: "The Ministry would regard the fact that instruction was given entirely through the medium of "Gaelic" to constitute a ground for "complaint". I can now let you know that instruction given entirely through Gaelic would not constitute efficient and suitable instruction for the pupils". A complaint would therefore be served by the Ministry. If the proprietors do not remove the deficiency complained of, the ministry will formerly strike the school off the register. It is an OFFENCE against the law to conduct an unregistered school." 2016: A fisheries protection vessel had its Irish name replaced with its English translation because the executive department which owns it has a "single language policy". 2018: Queens LOL 1845 - "There is no price at which the Irish Language Act can be allowed into law." The crocodiles are anxiously waiting. Gaeilgephobia - Articles by Colm Ó Broin. "But all these charms are fled "... maybe not? Community welcomes intention to plan. The President, the bureaucracy and the language! Coimisinéir not a child of Celtic Tiger! Bring back the tally stick!